UPDATE: January 2018 – SOLD, car is no longer available. Largely original, totally rust free, un-restored and un-molested with a fabulous story of 50+ years with its original owner. 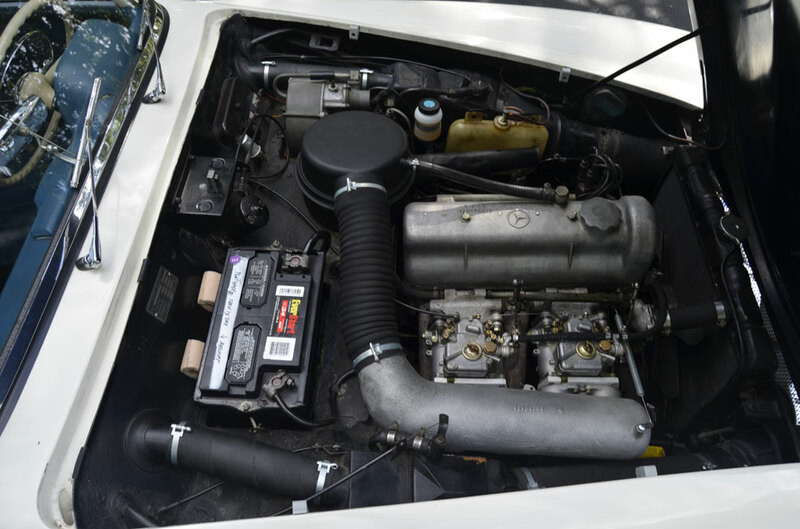 This 190 SL is sorted, runs and drives beautifully. Extensive history folder including original bill of sale, books / manuals, assorted ephemera, tool kit, jack and, rare for a 190 SL, factory belly pans. Kinder seat, top boot. Single owner from new until current owner’s purchase in 2012. This is a numbers matching example, as per serial and engine numbers on original Bill of Sale. Originally ordered by American serviceman based in The Hague, Netherlands, Col. Albert H. Snider. 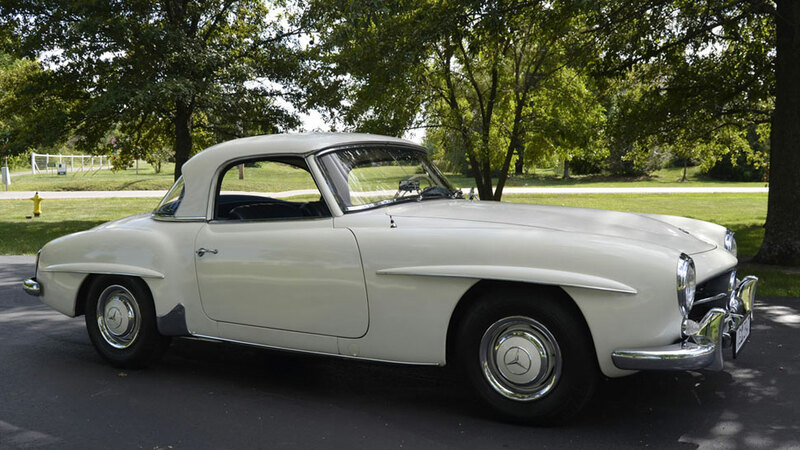 Mr. Snider and his wife picked up their 190 SL at Cederwall-Larsen & Patt, the Mercedes-Benz dealership in Oslo, Norway on May 21, 1962 and embarked on a Scandinavian driving tour. They toured all over Europe in the car in their free time over the next two years. Period photos and marked maps of their travels are with the car. 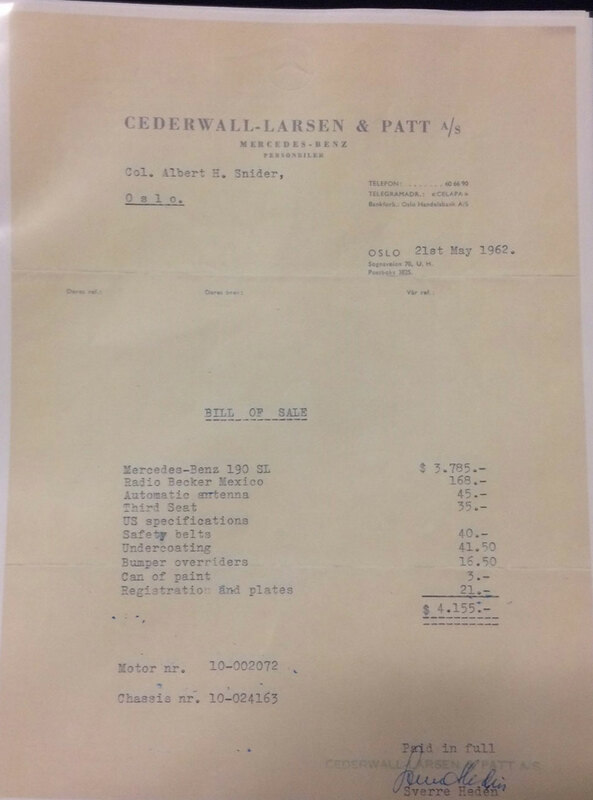 Original Bill of Sale from the Mercedes-Benz dealer in Norway is present with the car’s extensive service records and history documents. 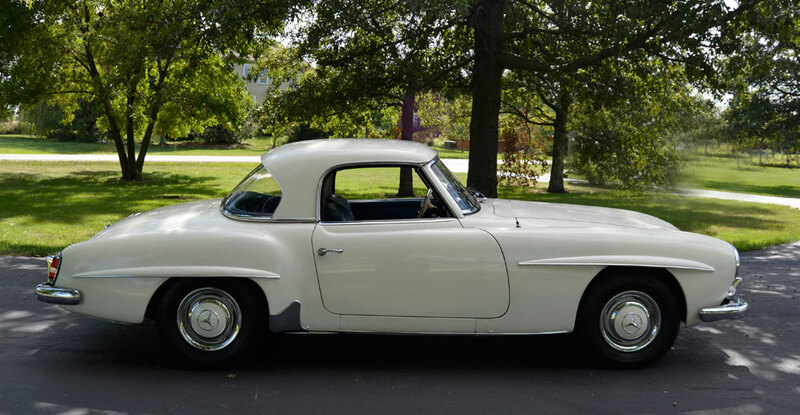 Owned by the Snider family from 1962 until March 2012 when the current owner was contacted by Mrs. Snider via a mutual friend, knowing she was looking for a good home for the car. 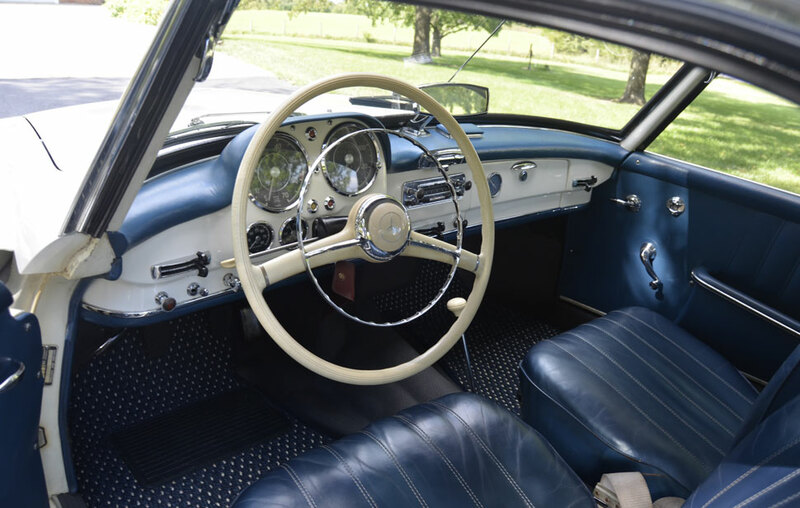 The current owner, a Kansas based car collector, has enjoyed the car over the past 5 years tending to various needs with an intent on maintaining the original charm of the car while making sure it was a reliable driver. Work done since 2012 includes brakes, wheel bearings, tires, installation of an n.o.s. gas tank, factory correct hoses and clamps, complete tune-up, oil, all fluids flushed / changed and other regular maintenance. A set of Weber carburetors were also installed. 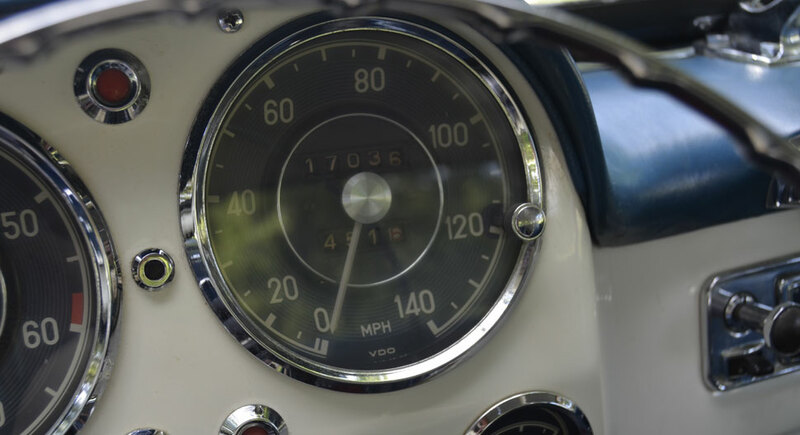 According to the owner, who also has several Ferraris in his collection, “Solex carbs are in great shape I just preferred Webers, so we put them on instead. After buying the car “I spent over $12,000 getting it back to safe, reliable operating order” after many years of just occasional use. All sheet metal is original, correct spot welds throughout engine bay, exterior and hard top paint is original, correct and original body # stampings. The car has never rusted, the original spare tire is still in the trunk with original trunk floor and jack. Newer soft top is in a box that goes with the car. 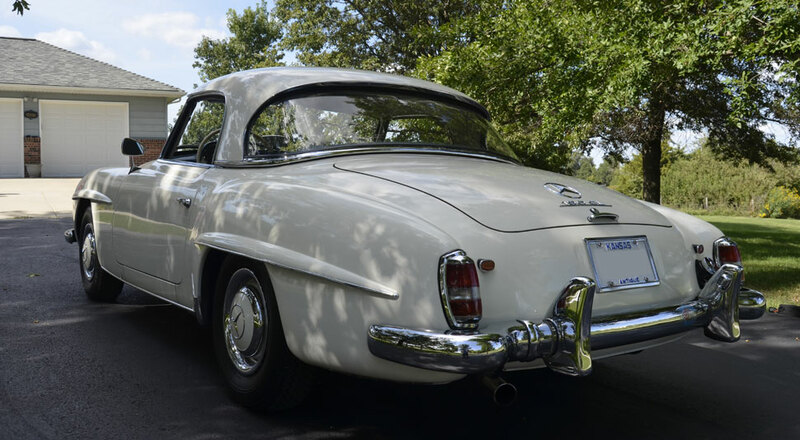 For 50+ years it was the original owner’s weekend car used for casual touring, road trips and Mercedes-Benz Club events. Various club car show trophies go with the car. 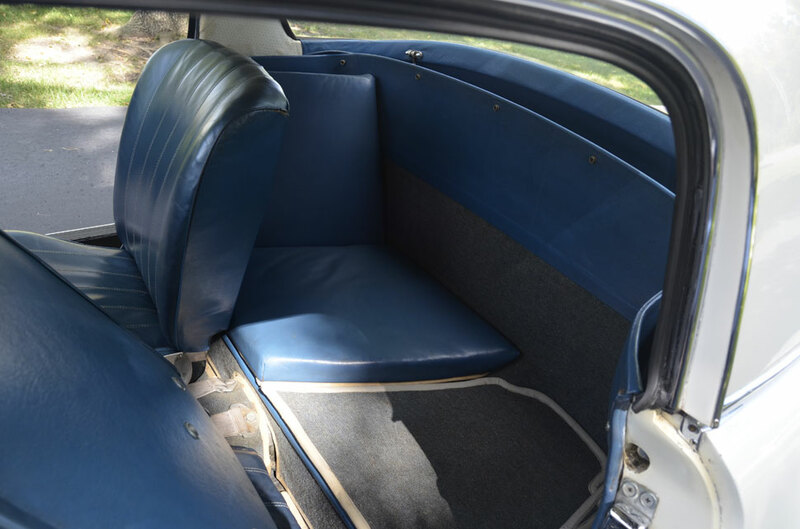 Original leather front seats were reupholstered, only seating surfaces, bottoms and backs , at some point, judging from the condition and material, probably in the 1980s. 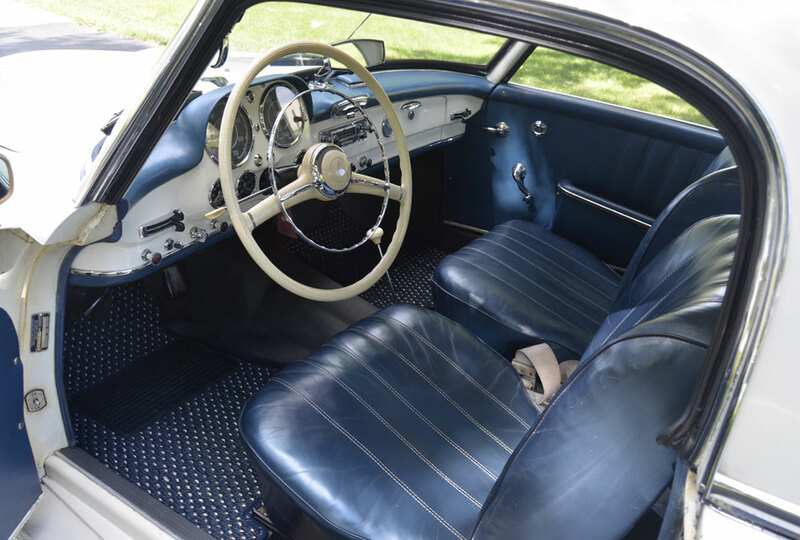 Seat sides and seat backs are original material. Original rubber floor mats reside under new Coco Mats installed by the current owner. Original Bill of Sale shows various options including the Becker Mexico radio, antenna (Hirschmann red top) and seat belts. 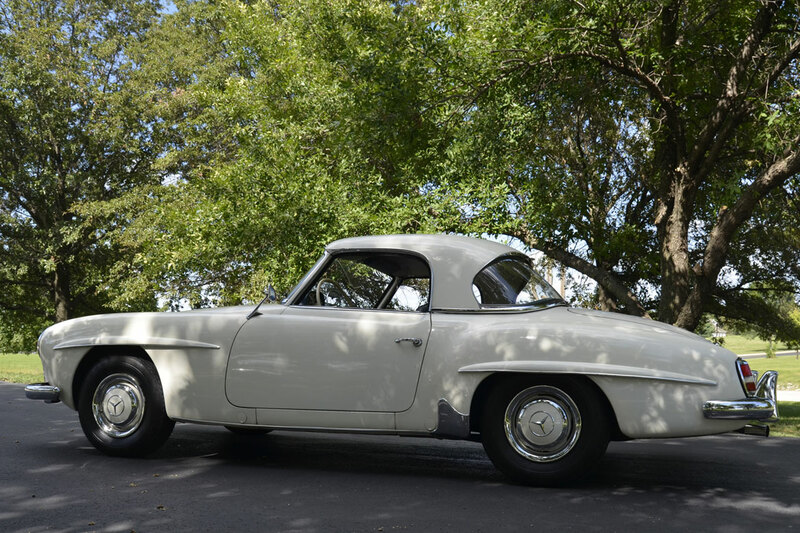 A fabulous, largely original, car from a high quality collection with documented ownership history and a charming story of how this car lived with its original owner for more than 50 years. Click here for almost 50 detailed photos of this car.